My older sister and her husband will be celebrating their Silver wedding anniversary this coming May. I'm just so happy for them for there are not a lot of couple wherein their wedding anniv. can reach this far. They are actually working overseas right now and I'm not sure what their exact plans for their anniversary. Initially, I heard that they'll come back home here to renew their vows at the church but told them that it's not a practical thing to do these days. I guess they realized that the expenses that they'll spend on the occasion can be spend on an overseas trip with us. Who knows they might go to any Asian country or board a cruise ship to have fun. Whatever their plans are, I know it will be for the good of many. Knowing my sister, she'll make sure that they'll include us with their plans. I wish every couple can celebrate their silver anniv till golden. 1. Finished all my due tasks for today. Now I have time to do some digi designing tomorrow! 3. Brazo de Mercedes cake for snack. 4. My Sophie girl following my command. 5. All bills paid already.. Yahooo.... Now I can shop! My nephews and nieces are growing so fast. 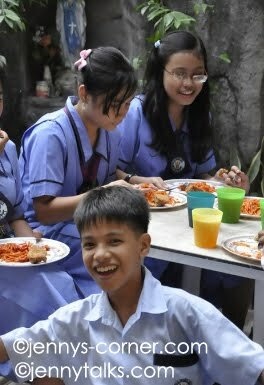 Dither turned 13 on January 6 and his mom cooked something special for him that he shared with his highschool classmates. After school hours he invited most of his classmates and they went to our house for a small birthday party treat. He's already 13, still small and skinny. He's one of the smallest in their room and sometimes mistaken as a grade 4 or 5 pupil which he doesn't like. I'm sure one of these days, he'll grow more and mature. The best thing is that he is doing great in school and he's not getting sick unlike when he was in his elementary days. 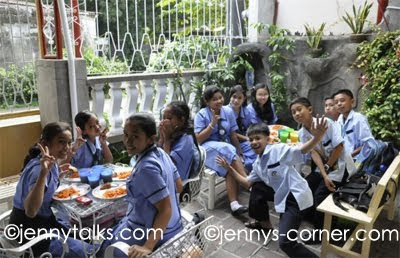 Some photos on his 13th birthday with his classmates. 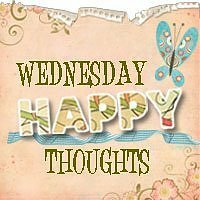 Hello everyone, this is my very 1st post for this blog this year as I've become too busy with a lot of things! Anyway, there's so much that has happened this new year and I'm hoping for more blessings and work. I'll be uploading photos soon so you can see all the happenings with my friends and family. I'm also slowly making some make over at our house. It started with some appliance shopping last Christmas and we've been wishing to also have a brand new LCD TV this 1st quarter of the year if budget will permit. Mom also asked our helper to change our leaking bathroom faucet with a new one and had our doors fixed. There's so much to do this year and I'm all smiles to do them.